Franklin is big- topped, extra-long, has great depth of rib and stands on a great set of feet and legs. Franklin 's highly productive dam has 3 natural calves @106 WR; 3@103 YR; 4@116 IMF and 4@108 RE. 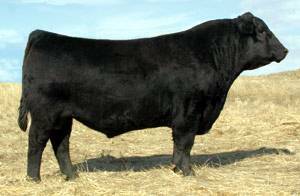 Franklin 's dam has a near-perfect udder and is a standout cow from a phenotype standpoint.